I fondly remember visiting Bingley’s (one of the United Servces partners) in the mid-60s and asking Mrs Bingley ("Ma" Bingley as she was fondly known to us), whether LTO 10 was operating that day, as I wanted to photograph it. No sooner said, than she shouted for her daughter (?) who was the operations manager, and said – "Put t’Daimler on’t teatime dupe, ‘cos there’s a lad here wants to take a snap of it!" As promised, LTO 10 arrived into Wakefield bus station at about 5.30pm, and I got a (not very good) shot of it. Wonderful times which can never be repeated. 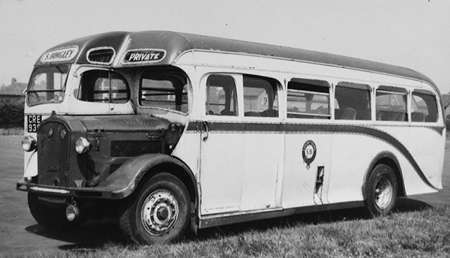 The above bus was originally owned by A Skill of Nottingham and was delivered in 1950. Skills were supposed to take delivery of another CVD6 with Duple body as above but it went to W Gash & Sons instead as there DD7 (LNN 353) view at this link scroll down a bit and you will find two shots. My friend Paul has revived many happy memories of our days in the Wallace Arnold traffic office. "Ma" Bingley was Phyllis and was the "P" in "W. R. & P. Bingley – she was as Paul reports a "no nonsense" lady who quite simply got things done. That she was also a competent conjurer is beyond argument. All desperate calls from WA Hunslet for heavy assistance when summer peak demands got out of hand were calmly answered with "Ow many der yer want ??" No matter how many extra coaches we needed the necessary vehicles would appear at all hours as if by magic – fresh from pit contracts or schools or wherever – all manned by chaps who knew their place and "did as Phyllis said" without question and the impossibly large seaside passengers would all be gone without a hiccup. Slightly off the Daimler topic I admit, but Phyllis deserves an accolade as one of the real legends of the Industry. Great story, Paul/Chris. Keep ’em coming! The human side is just as interesting as the bus side. The above photograph is featured on the ‘sct61’ website, along with another photo of LTO 10 in the caption of which it is asserted that Skills ordered three of these vehicles and that it was two, rather than one, which were diverted to Gash of Newark. LNN 353 (Gash DD7) was apparently intended to become Skills No.30 (LTO 30) and LRR 403 Skills No.20 (LTO 20). I haven’t been able to retrieve the Gash fleet number of LRR 403. A few days ago I received an email from a Mr Paul Haywood with a photo attached, below is the email, above is the photo. United Services was owned by three families but at times it was hard to tell just who owned what, I do hope somebody can supply the information Paul is wanting, if you know please leave a comment. What I have managed to find out about this bus is that it was originally with Ribble Motor Services fleet number 2517 a Leyland Titan PD2/1 with a Brush L53R body. A batch of the original PD2/1s were re-bodied by Burlingham as L53R and converted to 8ft wide at the same time making them PD2/3s. There is also to the left in the above photo a Guy Wulfrunion one of the forum members has been asking about them lately. If anybody could send me a photo of one I wouldn’t mind doing a little article about them, they were a bit different. I can answer who owned the Titan. It was Cooper Brothers. The clue is the United CB Services fleet name on the side of the bus. The Cooper Brothers fleet had "CB" inserted between "United" and "Services". The WR & P Bingley fleet had a different fleet name style with "United" directly over the "Services" name. The "U" and the "D" of "United" were oversized so that the "Services" name fitted in between underneath. I hope that helps. I was brought up in a village called Crofton. 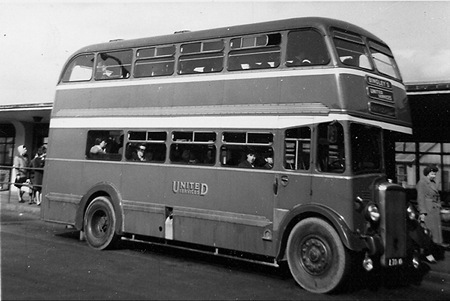 The United fleet ran at the edge of the village via Doncaster Road into Wakefield. I have some memories of the double deckers however as I was born in 1961 my memory is far clearer with vehicles from the 1970’s and 1980’s, most notably the three Plaxton Derwent bodied Lepoards (that had loads of character) that Bingleys used and the Panther Cub and two Bedfords that Cooper Brothers used. I have since discovered that it started life as a PD1A with a Brush body in 1947. In 1955 it was rebodied by Burlingham and widened to become a PD2/3. It was bought by Coopers in 1965 and withdrawn (presumed scrapped) in 1972. Thanks to John Kaye for this information. I can confirm that the CB does indeed stand for Cooper Brothers. My Grandad was Lawrence Lee Cooper and his brother Walter Lee Cooper. Their association with the Bingleys was very close as Dot Bingley, Phillis Bingleys daughter was my Godmother. Can I be a pain in the neck? I also thought that, when they sold them – and Ribble had a lot of them – these interesting rebuilds were given 7.4 engines in exchange for the 0.600s. I’m grateful to all correspondents in this topic, as I’ve learned much that I didn’t know about this fascinating trio of joint operators. I believe, open to correction, that Bingley’s had considerably more mileage than the other two, and little ever seems to be written about Everett the third partner. I worked at Caldaire/Arriva in Pontefract with Mr. Bill Bingley who was a relation of Phillis. Earlier in my career, at Samuel Ledgard of Leeds, we had two identical ex Ribble rebuilds BCK 427/441 – fascinating and very sound vehicles they were too !! Also in my Arriva times we had a school special from Crofton High School and so I became acquainted with the A638 and Mark B’s village in the 1990s/2000s. In the 1960s, when working in the traffic office at Wallace Arnold’s, we had frequent communication with Mrs Phillis Bingley who seemed to be able to conjure up incredible numbers of her coaches and drivers for hiring in at our busy times. This was to a Leeds resident like me a fascinating era – and area – with which to be involved and I wouldn’t have missed any of it for the World. A very interesting question from David about the possible engine exchange and something I haven’t heard before. I too would like to know because I travelled on this vehicle, it would have been around 1970/71, one Saturday afternoon and I had a short ride from Hemsworth to South Kirkby but it’s so long ago now that I have no recollection of the engine sound! Incidentally, one of the un-rebuilt examples, BCK 440 with it’s original Brush body ended up as a mobile shop in the village where I was born and was often parked on the street where I lived, the registration has stuck in my mind ever since! 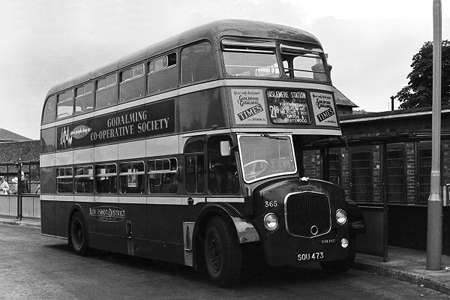 W R P Bingley had a regular works service to Blakeley’s Boot Protectors (segs in local parlance) in Armley Leeds This involved a number of Yeates bodied coaches up to five in the sixties. Thank you to all for these most interesting postings, I travelled to school in Wakefield from the mid-sixties onwards, very frequently on the United Service as they were more interesting than West Riding. Many of these journeys were on ‘BCK’, often very full! It probably worked harder for Coopers than it ever did for Ribble. I recall the Cooper’s fleet was for several years BCK 460, CCK 354 (ex-Ribble all-Leyland PD2) and MDT 220 (ex-Doncaster Roe-bodied Regent III). The Leylands seemed to be the mainstay of the fleet, doing most of the Wakefield-Doncaster workings, and the AEC spent more time on the peak-hour short journeys Wakefield to Hemsworth or South Elmsall. The photo is 1969 or later, as hiding behind BCK is EWX 819 H, Bedford VAM / Willowbrook which (I think) replaced CCK 354. Yes, Bingleys seemed to be the dominant member of the group. The basic Wakefield-Doncaster service required three buses, logically one per member, but there were many duplicates and short workings and Bingleys seemed to provide more than one-third of those. My parents used to say that there was previously another member called Granter’s, so possibly Bingley’s had taken over Granter’s share ?? It would be fascinating to learn how the duties were shared out, if anyone has any info? It would also be great to see a fleet history for all the members, if one exists ? As with many operators, Ribble was a rich source of vehicles for United Services. The ones I have record of are BCK 438, another of the type pictured above with Everett, White Ladies BRN 281 (Burlingham) and DCK 213 (East Lancs) All Leyland PD2’s CCK 354 and DRN 268 and Brush bodied PD2’s CCK 646 and CCK 653. There were also utilities ACK 755 (Daimler) and ACK 819 (Guy) The vehicles of Everett seen to have been rather anonymous, Bingley’s were usually well turned out with the fleet name as shown above whilst Cooper Bros, particularly when in the two tone blue and cream were quite impressive. 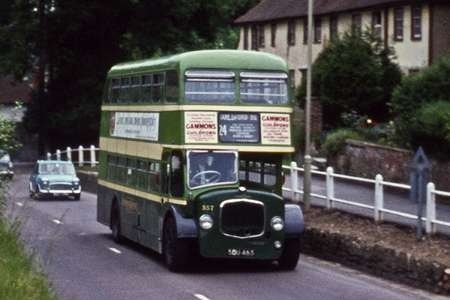 One interesting connection with the recent postings about Blue Bus Services and W Gash is that Bingley’s apparently also had a Burlingham Seagull bodied Daimler Freeline. I’ve never seen a picture of it, does anyone have one? I recall back in the late fifties or early sixties that whichever of the operating partners of United Services (possibly Everetts) that operated from the Kinsley depot near Hemsworth used to leave vehicles parked outside overnight, and, come the morning, rabbits had to be chased off the busses prior to them entering service. Mick, the Kinsley Depot was the headquarters of W.R. & P. Bingley and was eventually taken over and used by Metro/Yorkshire Rider. Nice story, Mick. Those who wanted a nice rabbit for dinner, no doubt caught the best one, before chasing off the others! Mick and Chris H – the reason for the presence of the rabbits has just occurred to me – what else could one expect at premises called Hunter’s Farm Garage, Kinsley ?? I’m intrigued by Dave Williamson’s information about these vehicles being fitted with 0.600 engines from withdrawn vehicles. If this was done in 1958/9, it would seem a bit early for anything with the post-war 9.8ltr engine to be withdrawn. I wonder what the donors were, PS2 coaches perhaps? They’d been chased by the greyhounds (whippets?) from Kinsley dog track! The answer to Chris Barker’s question is that 19 of those 21 O.600 engines came from 1946/7 PD1s, which had themselves been re-engined in 1948/9. Their original 7.4 litre engines were fitted to pre-war Leyland TS and LZ vehicles, replacing their original petrol engines. Of the remaining two O.600 engines, one came from a 1948 PD2, which was then withdrawn, and the other is described as a spare engine. These Ribble rebuilds never cease to inspire comment. Does anyone have a copy of the book ’52 Years Of Ribble’, by Tom Collinge? Having once owned a copy of the book myself and knowing the detail into which the fleet history goes, I can’t help but think that the question of which engines went into which buses from which would be well and truly settled. 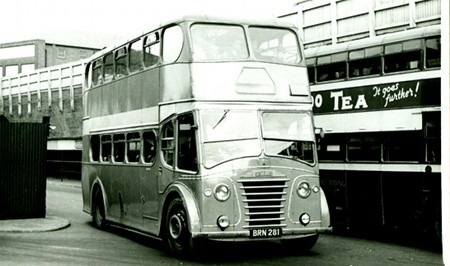 If one engine came from a 1948 PD2 which was then withdrawn this could have only been 2648, the only Burlingham bus-bodied (as opposed to coach-bodied) PD2 Ribble operated. It was the first PD2 to be withdrawn, going before the Brush lowbridges 2661-91, which themselves went probably a couple of years earlier than slightly older Leyland-bodied examples. One notion which I must contest is Dave Williamson’s assertion that the difference between the chassis width and body width can be seen in the above photo, since the position of the wheels relative to the bodywork looks to me just as it would on any 8-foot wide bus. The chassis width would have remained at 7’6", yes, with the new body mounted on outriggers, but both axles have definitely been replaced. If you want to see what an 8′ wide body looks like on a 7’6" axle, refer to a shot of Bradford trolleys 703-39 (and possibly others, I’m not sure) which were rebodied in the late fifties/early sixties, being fitted with new front axles but retaining the 7’6" rear ones. Now I’m really going to set the cat amongst the pigeons and assert that, in the late 1960s (which was the only period in which I came into contact with the United operations) the Bingley depot at Kinsley was used purely as a coach garage, and the buses were accommodated at a separate depot at Upton. I’m pretty sure that WYPTE acquired only the Kinsley depot, the implication being that Upton closed in Bingley days. Paul, when you saw ‘Ma’ Bingley and her daughter in the traffic office, was it at a coach or bus depot (or both)? And were you at Kinsley, or Upton? Thanks David C for pointing out my mistake in claiming the rebodied chassis remained 7’6" wide -"should have gone to a well known chain of opticians" springs to mind! New 8′ axles were fitted prior to being rebodied by Burlingham. The PD2 that donated its engine was indeed 2648, as you surmise. David C – sorry for the late reply, but I’ve only just seen your question. I suspect it must have been Kinsley as this was where we knew "Ma" was based. The other night we had a talk in our village Institute by a local historian who, at the end of a very interesting talk on "Keighley between the wars" acclaimed – "Forget official history books written by academics, real history lies with ordinary folk and their memories!" How true – that’s if we can remember things! It’s been interesting to follow the discussion concerning United Services, particularly the recent Burlingham PD1 debate. Thought you may be interested to see another ex Ribble Leyland in the fleet seen here at Doncaster Marshgate bus station. The bus just in the shot would have been Laycock 75 (BCK 428), the other two being numbered 74 & 76 respectively. After acquisition (in 1966, I think) these three buses comprised Laycock’s entire double-deck fleet until joined in 1968 by ex-Ribble 1357 (ECK 927), a lowbridge Leyland-bodied PD2/12, upon which I took my psv test in November 1970. Although I worked for Laycock’s for about six months after taking my test, the only one of the buses illustrated above I drove was BCK 452, and this only on two/three occasions. This was because its regular driver (fitter Philip Baker) only had a midweek day off once every three weeks! I couldn’t drive BCK 437 (usually driven by Roy Laycock, who also had a midweek day off every three weeks) since the driver’s seat was jammed in its position, and I couldn’t comfortably reach the pedals! What a disappointment. The third rebuild, BCK 428, had already gone by the time I started with Laycock’s, having been inadvertently driven under the (very) low bridge adjacent to Nelson railway station. It was replaced by ex-City Of Oxford 968 (968 CWL), a Regent V/MCW (becoming Laycock 83), which I also drove on two/three occasions. 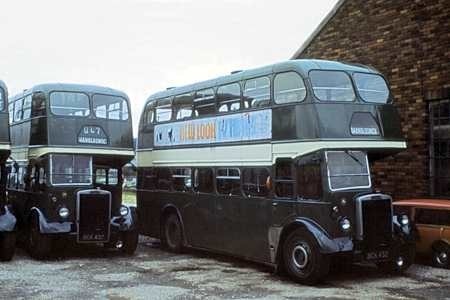 Of these four double-deckers (Laycock 74/6, 80/3) at least three survived up to the takeover by Pennine (not sure about the fourth), 74 later being privately preserved (in Ribble colours), and 83 subsequently operating for Wild’s, of Barnoldswick. Anyone know what ultimately happened to BCK 437? The last I heard (which is quite a few years ago now) its status was not known. Between 1954 and 1956 I was a pupil at Wakefield College and had United Services school contract to travel between Hemsworth and Wakefield. I don’t have any details of Reg Nos but I do remember the Types of buses used in the era. The three companies involved must have had some kind of rota because they appeared to change a couple of times each week. 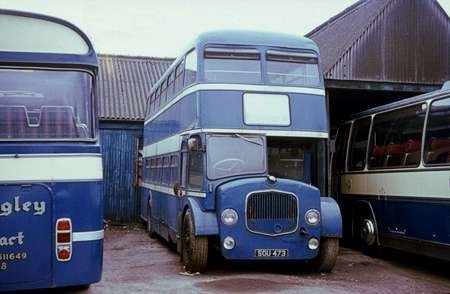 The most popular double deckers used by all three companies in those days were were Guy Arabs with utility bodies, and in winter freezing cold. Bingleys also ran a Leyland TS7/8, a very fast machine for its age but equally as cold in winter as the Guys. I think it was in 1955 when Bingleys acquired a low bridge Daimler, this was a superb machine compared with what we were used to. The best thing about it was it had an excellent heating system. After leaving college I joined the West Riding Automobile Co, and later moved on to the Yorkshire Traction Co. The job allowed me to drive all the different types of vehicles that I had admired in the past. Happy days. The United Services only had three partners, Bingley, Cooper Bros and Everett – The closest working relationship was between Bingley and Cooper Bros – Ma Bingley (Phillis) was based at Kingsley whilst Frank Bingley was based at Upton. The Coopers, Lawrence, Walter and Lols son Austin was based in South Kirkby depot opposite the Old Mill. A slight correction needs to be made to my reference above to Ribble PD2 2648. I could have said that it was Ribble’s only Burlingham-bodied PD2/3, or Ribble’s only PD2 with a Burlingham body to the same style as those on the PD1/3 ‘White Ladies’ (see pic of BRN281, above), or their only PD2 with a lowbridge Burlingham body. There were, of course, later Burlingham-bodied PD2/12s (1431-75). There’s a nice photo of 2648 in its Ribble days here www.sct61.org.uk/rl2648 (click on ‘higher resolution’ – and note the similarity of the bodywork to that on the adjacent East Lancs-bodied ‘White Lady’ PD2). It subsequently ran for a few years with Carruthers, of New Abbey, Dumfriesshire. I have seven black and white photographs of some of these fleets which I obtained with others from an ad in an Ian Allan publication in the mid to late 60’s. 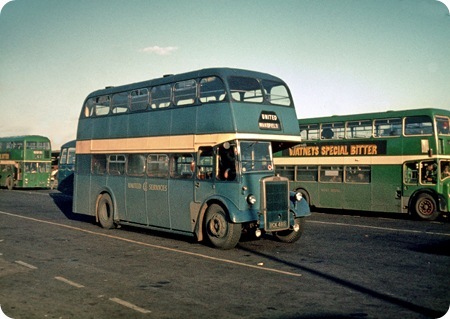 Bingley’s UWT 875 AEC Regent V in the identical location of 876 shown parked up in Wakefield bus station. LTO 10 Daimler previously referred to in the Northern Doncaster Bus Station. DCK 213 Ex Ribble about to leave Wakefield Bus Station. Cooper Bros’ CCK 646 Ex Ribble Leyland on the stand for Doncaster in Wakefield. MDT 220 AEC Regent III? Outbound from Wakefield passing Woolworths at the top of Kirkgate and a Daimler single decker. HWT 48 on the stand in Doncaster. Now the remaining two have no distinguishing marks and therefore I wonder if these were Everett’s? They are Ex Ribble Leyland BCK 438 unloading in Wakefield Bus Station and Regent III? AJX 243 on the stand in Doncaster. The plot widens with another photo in the batch which shows a Dennis coach CRE93? Operated by S. Bingley Luxury Tours, of 53 Westfield Road, Hemsworth. Presumably a relation? AJX 243 was owned by W. & H. Everett. It had been new to Hebble (No.28, later 228) in 1948, who withdrew it in 11/59 and sold it to dealer Frank Cowley of Salford. Everett’s purchased it from them in 3/60, and withdrew it in 8/64. Does anyone have a photograph of the heroine of this tale Phyllis "Ma" Bingley? David C, what a magnificent beast it was too, even though it was probably in it’s latter days. Many thanks for your link which contains a wealth of other fascinating vehicles and operators as well.